20 years later, this celebration of poetry has taken root and flourished. Teachers can order the poster from the Poets.org website or download a smaller page sized copy to use in their classes. Students make a sound, using their own voice, without words, to express how they are feeling at the moment. Students listen and describe the sound by writing in their journals. Students read six poems and complete a T-chart with one side with what “jumps out at them” in the poem and on the other side, why they think this is important to the poet’s voice/poem. Students draft a letter addressed to a chosen poet, telling him/her what in the poem spoke to them, and asking questions relating to how the poet wrote this poem. The lesson plans include links for students to upload their letters as an authentic task. During the month of April, teachers can follow updates on Twitter using the hashtag #npm15 and follow the Academy of American Poets @POETSorg. The end of National Poetry Month will conclude with “Poem in Your Pocket Day” (April 30) and teachers and students alike can celebrate by selecting a poem, carrying it, and sharing it with others throughout the day. Copies of suggested poems (in the public domain) are available by download. For those who would want to continue the celebration of poetry all year, there is also a link to a poem a day a previously unpublished poems is delivered by e-mail daily during the week and classic poems delivered on the weekends. 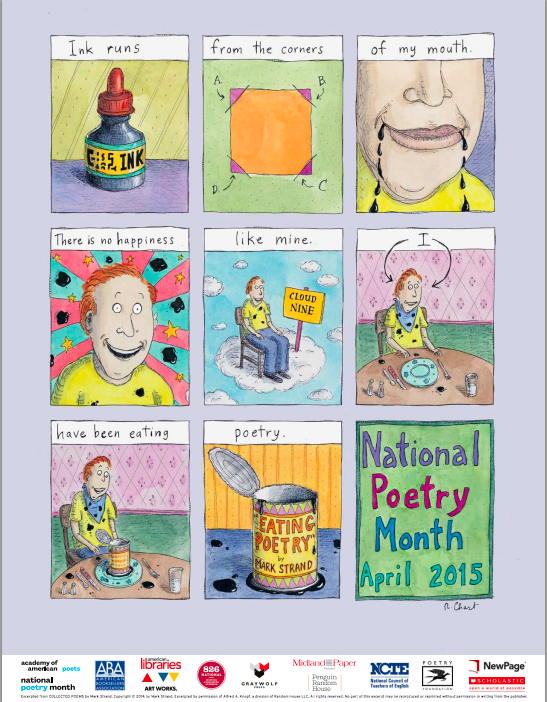 NOTE: The American Academy of Poets thanks the following organizations who have helped make National Poetry Month 2015 possible: 826 National, American Booksellers Association, American Library Association, Graywolf Press, National Council of Teachers of English, National Endowment for the Arts, New York City Department of Cultural Affairs, Papyrus, Random House, and Scholastic.